I was in Kerry recently for a week and I was staying near Ballinskellig. A number of times during the week while I was driving around I saw signs for Skelligs Chocolate but it was only on the last day before heading home that I made it to the Skelligs Chocolate factory/shop. It was a drizzly day in Kerry and the small factory/shop was packed with people. I bought a selection of different chocolate bars with flavours ranging from ‘Rose & Pistachio’ to ‘Gin & Tonic’ and some mint brittle. The quality of the chocolate is excellent. I think my favourite was the Dark Chocolate (53% cocoa) with Sea Salt. I love dipping pretzels into nutella because there is something about the combination of chocolate (from nutella) and salty crunchiness (from the pretzels) which is truly yummy. 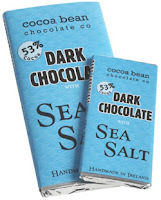 Eating the Dark Chocolate with Sea Salt bar was sort of like eating a fast food version of pretzels dipped into nutella! Don’t worry if you don’t think you are going to be in Ballinskellig anytime soon, just check out the list of stockists on their website or alternatively you can order online directly from their website .